POPASNA, Ukraine -- Alexei Rozposienko begged his mother to flee as a surge in fighting between Ukrainian forces holding this city and the Russia-backed rebels nearby exploded night after night. Residents of Popasna gather plastic film this week to cover blown-out windows amid artillery blasts. “I said, ‘Mom, I can’t stay in this house. My life is more valuable than this,’” the 25-year-old welding student said. But it wasn’t until his mother timidly approached the window this week and saw sparks flying from rocket-fire below, like some kind of deadly fireworks display, that she finally relented. 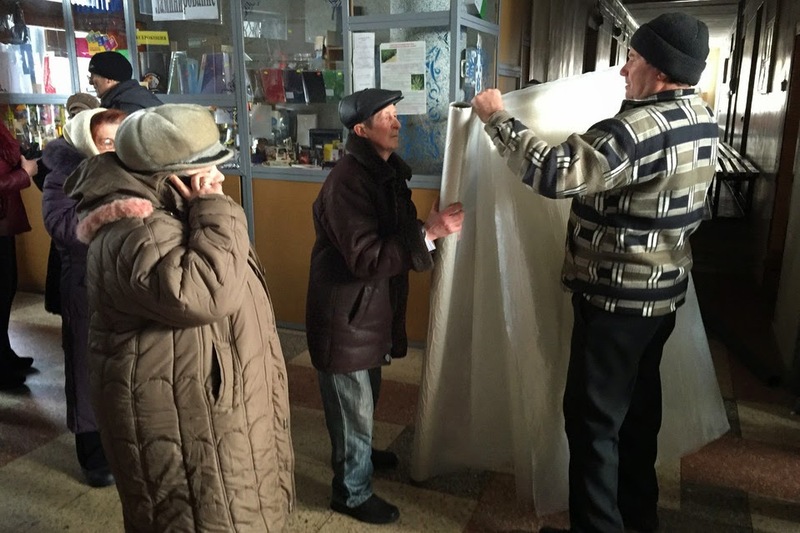 They caught one of the last buses out of town, joining a new wave of displaced people in eastern Ukraine amid a resurgence of fighting that effectively put an end to a cease-fire that had been shaky for months. Thousands of people who thought the worst had passed have suddenly found themselves catapulted back into the crossfire and scrambling for safety in the dead of winter. Ukraine this week announced plans for evacuations, evoking memories of a mass exodus in both directions during the heaviest fighting last summer. But the government’s resources so far are limited to a trickle of buses across a broad area, and few residents seem to know the details. On Wednesday, Ukrainian authorities in the Donetsk region said they had evacuated 346 people, including 161 children. The mayor of Popasna, Yuri Onishchenko, estimates there are about 5,000 to 6,000 people left in the city, which he says had more than 20,000 before the fighting began almost 10 months ago. Most who wanted to leave have already done so, he said. The city has gone back and forth—from Ukrainian soil to de facto rebel republic and back to Ukraine. Despite sporadic violence, there was hope a September peace plan would eventually take hold. This past week, however, the Russia-backed militants launched an offensive to encircle nearby Debaltseve, a Ukrainian-held railway hub that juts peninsula-like into rebel territory. Attacks on places like Popasna have become part of that effort. At least four residents have died in the past week—all civilians killed by artillery fire. One middle-aged man was hit at a bus stop, the others killed in their own homes. “We’ve never had anything like this before,” Mr. Onishchenko said. Under the government evacuation plans, residents are supposed to call a hotline and submit an application. Rather than wait, most leave on their own, but many elderly and low-income residents don’t have the wherewithal to go anywhere. Those in Ukrainian-held towns who want to stay with relatives on rebel turf now need a pass from Ukrainian authorities to cross the front, which can take 10 days to acquire or be denied. Where Ukrainian authorities are absent, some volunteers have stepped in. Evgeny Kaplin, a 25-year-old youth-group leader from Kharkiv, has been driving into some of the most dangerous areas to rescue some of the thousands of civilians he says are left in areas such as Debaltseve. “We were yelling already a week ago that people should be evacuated from there,” he said. With just five to seven volunteers going on evacuation missions, his small group can only take so many. In Popasna, residents braved a lull in fighting Wednesday to slip across the ice-encrusted sidewalks in search of food and water. Some lined up at city hall for heavy plastic film to cover their windows. Like many remaining residents, Alexander Hushevsky, a 59-year-old metalworker, had no heat, no electricity and no running water at home. The previous night had tested his nerves: Artillery shells hailed down around his apartment and exploded a few dozen yards from his door. It was the worst night he could remember since the conflict began. “I consider myself a brave person,” Mr. Hushevsky said. One elderly woman had brought her handicapped brother to city hall in search of a way to get out. She said she didn’t have the money to hire a car, and regional buses had stopped working, leaving her desperate. The mayor promised an evacuation bus in the coming days. Wearing just a sweater, he was sliding across the ice, loading bottled water into a car, as he ran around making deliveries to people hiding in frigid basements. Mr. Rozposienko, his mother, two sisters, a niece and a nephew fled to the nearby city of Soledar, where authorities put them up in an empty wing of a hospital. They are six to a room. “It’s ideal,” Mr. Rozposienko said, thankful for any place with electricity and away from day-and-night explosions. “It’s great,” his young nephew piped in. Popasna’s mayor, who supports the government in Kiev, admits to being scared that the rebels will retake the city. He reckons more than half the city supports the separatists, though he says opinions are changing as homes come under fire day after day from rebel positions. “How should you feel when your own are fighting against your own?” retired policeman Alexander Yefimtsev said, explaining that he had friends fighting on both sides. The 55-year-old said his children had left Popasna for safer areas, but he refused. “Where should I go? Why should I create problems for other people?” Mr. Yefimtsev said. We all need to help refugees in East Ukraine. People who have 2 or more flats in Ukraine for rental. Do like me and other people I know. Let Refugees live in flats for free til situation in East Ukraine getting better. We all have responsibility to make life better for families with children and older people who lost everything they had in life because of this terrible war.